The Denver Broncos visit the Kansas City Chiefs in Week 8 of the 2017 NFL season. PFF previews the top player matchups of the game. TE A.J. Derby vs. LB Derrick Johnson – Derby led the Broncos in targets last week with seven, and appears to have an increased role in the passing game with WR Emmanuel Sanders out with an injury. Derby ran a route on 87.5 percent of his snaps last week, his highest percentage of the season, however his receiving grade of just 39.7 marked a season low. Johnson has been great in coverage this season, earning a coverage grade of 86.2, ranking fourth among all linebackers. His incredible mark of 40.7 coverage snaps per reception allowed ranks first among linebackers by over 25 coverage snaps. T Menelik Watson vs. Edge Justin Houston – Watson has had a rough start to this season, earning a grade of just 38.7 and ranking 70th of 74 tackles. While Houston has been stronger in run defense than pass-rushing, he still ranks tied for fifth among 3-4 outside linebackers with 27 total pressures. Look for Houston to have a field day in Week 8, as Watson has allowed seven sacks already this season, more than any other offensive lineman. WR Demaryius Thomas vs. CB Marcus Peters – The Los Angeles Chargers held Thomas to just two receptions for nine yards last week and his lowest graded game of the season. He has a difficult matchup this week against Peters, whose coverage grade of 83.5 ranks 17th of 110 cornerbacks this season. Peters averages 0.79 yards allowed per coverage snap, while Thomas averages 1.83 yards per route run. 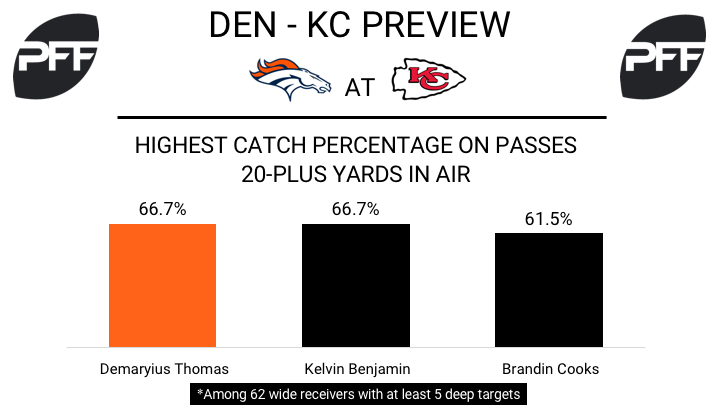 The Broncos may try to continue to lean on Thomas with Sanders still out, but with the tough matchup they may have to look elsewhere most of the game. TE Travis Kelce vs. S Will Parks – Kelce was dominant against Denver last season, hauling in 19 receptions for 261 yards and 3.22 yards per route run in two games. He is PFF’s top ranked tight end this season with an 86.9 overall grade. Kelce’s 1.85 yards per route run ranks seventh among tight ends with 100-plus snaps in route. He will likely see coverage from a few different players, but we think Parks gets the bulk of the assignment. He’s ranked 43rd at safety with a 74.9 overall grade. Parks has been targeted 21 times in coverage this season and has allowed 16 catches for 154 yards. T Mitchell Schwartz vs. 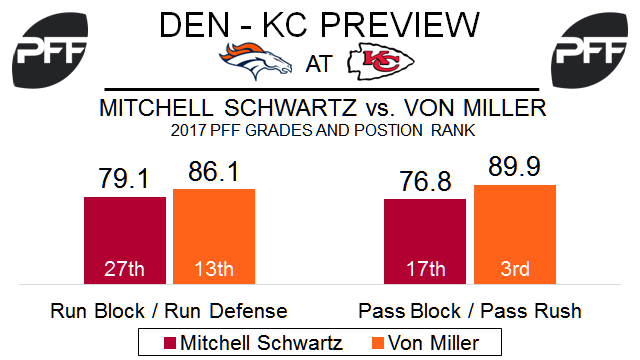 Edge Von Miller – Schwartz draws back-to-back matchups against two premier edge defenders in the NFL in Khalil Mack and now Miller. Schwartz has allowed three sacks and 15 total pressures in 263 pass-block snaps this season, and is the 19th ranked tackle in PFF pass-blocking efficiency. Schwartz allowed two sacks and seven total pressures in two games against Denver in 2016. Miller is PFF’s second ranked edge defender this season with a 91.2 overall grade. He is second among edge defenders with 35 total pressures. Miller had three sacks and 11 pressures in two matchups with the Chiefs last year. RB Kareem Hunt vs. LB Brandon Marshall – With the Broncos strength at cornerback, the Chiefs will look to establish the running game this week. Hunt is PFF’s top ranked running back with a 93.3 overall grade through Week 7. He leads all backs this season in explosive runs (gains of 15-plus yards) with 10, and missed tackles forced with 48. Marshall has made six run stops (plays graded as a “loss” for the offense) in 121 snaps against the run, and ranks 72nd of 86 linebackers in run-stop percentage. He’s allowed 24 receptions for 220 yards and one touchdown in coverage, and ranks 69th at linebacker with 6.3 cover snaps per reception.